Base64 decodes data using DUDE. Base64 encodes data per RFC 4648, Base 64 Encoding. Definition at line 57 of file base64.h. 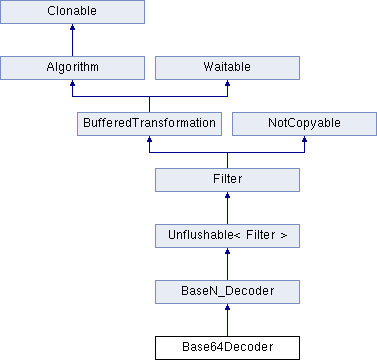 IsolatedInitialize() for an example of modifying an encoder after construction. Definition at line 63 of file base64.h. Base64URLDecoder for a decoder that provides the web safe alphabet, and Base64Encoder::IsolatedInitialize() for an example of modifying an encoder's alphabet after construction. Definition at line 86 of file base64.cpp.